Lil’s big weekend at TOPS! Lil had a perfect weekend in every sense of the word. QQQs both days at TOPS (Terriers Only Performance Summit). I was blown away by how much fun she had running every single course. 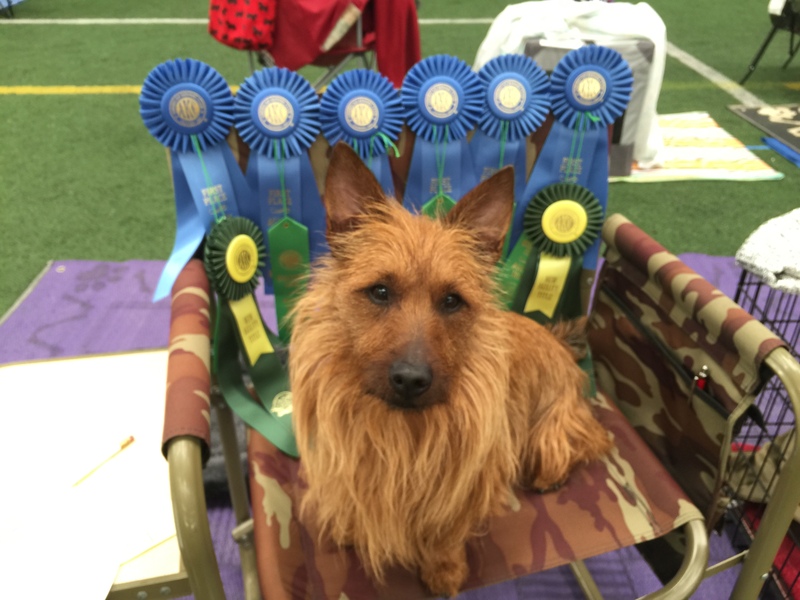 Not too shabby considering we have not done AKC for over 3 years. Her course times were off the charts too! SCT for Exc Standard was 81 seconds both days: Lil ran the course in 46.65 seconds on Saturday and 45. 20 seconds on Sunday. In T2B her times were 33:32 on Saturday and 30:21 on Sunday. I have always sensed that Jumpers courses are her least favorite but I think adding Weave Poles like they do in AKC helps break up the monotony of jump jump jump jump jump..YAWN… and maybe a tunnel before jump jump jump jump jump. She ran both Exc JWW with good speed (15- 17 seconds under SCTs). 🙂 Following her 100% Q rate in Excellent, she is now in Masters Standard and JWW. Other highlights were meeting all the Australian Terriers and their people. What a lovely group of dogs and people (very friendly too)! 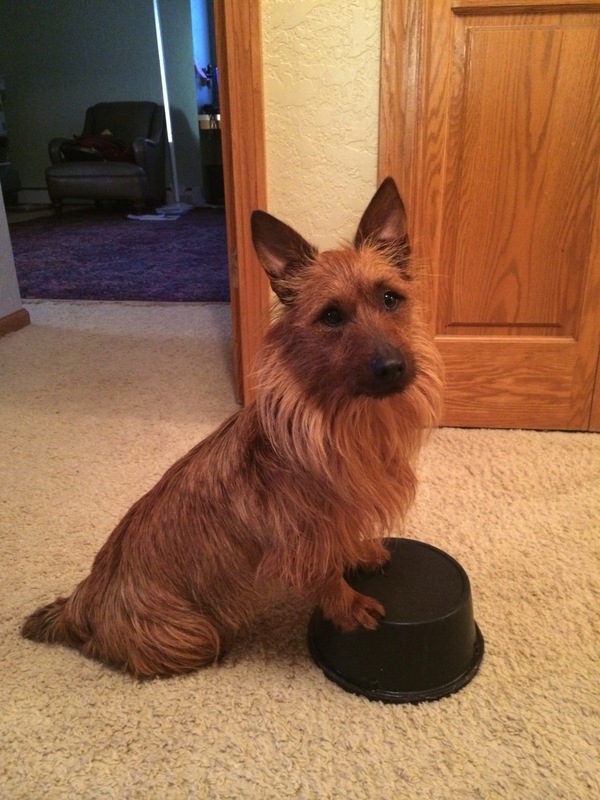 Icing on the cake was Lil earning the distinction of “Highest Scoring Australian Terrier.” I could not be more thrilled to have a partner like Lil! Her kennel name “Just for a Thrill” couldn’t be more perfect! Here are videos from this weekend. I loved both T2B courses. The crowd gets into cheering everyone on, which makes it even more fun. I love the variety of Standard Courses. Lil had no issues performing obstacles she has rarely even seen the past three years, like the Table, Teeter, and Spread Jumps. Its a bummer that the videographer lost Lil during the trickiest part of this course. She ran that part beautifully! After 3 days running Jake and Lil during Sharon Nelson’s Seminar, I was curious to see how they would run on the 4th day in a row, especially Jake since I am thinking about running him at Champs which is a 4 day event and he has never done four days of agility in a row. He did very well at the seminar. The couple of times he lost focus he quickly got it right back. However, at the Fun Raiser Trial (day 4), he lost focus and did not come right back. This was very disheartening for me because we have been working on this issue on and off for most of the 8 years Jake has been part of our family. I think four days in a row played a role in his not coming right back but I think having more open space around the courses during the Fun Raiser contributed too. During the seminar, participants tended to sit close to the action to be able to hear Sharon’s feedback. Once the chairs were removed the arena looked noticeably larger to me and I assume it looked more expansive to Jake as well. Since Champs is held in a HUGE arena, I am still on the fence about whether I think Jake will be able to stay focused or not at Champs. As you can see in Lil’s Bonus Box run above, she ran very well on Day 4. She loved the firm dirt footing in this horse arena. I did too! Lil has had a very reliable running A-Frame for a few years now. The reason I am asking for a stop (4on) is because this A-Frame is 8′ vs. 9′ and she does not automatically adjust her striding so lately I have been playing around with stopped contacts sometimes and running contacts other times (like when the A-Frame is 9′). So far she does not appear to be confused by mixing things up. (above) One of Lil’s runs at Sharon Nelson’s Seminar. Handlers got to pick their own Bonus Box positions. It was great to be able to look at the course challenges and to determine where I wanted to be to meet those challenges. The thing I need to figure out is how to change my emotional state when he loses focus and does not come right back. If I can remain emotionally neutral, he responds better than when I stress out about it, which he picks up on and makes the situation worse. Sharon gave me some good solid advice about what to do when Jake loses focus and I will be doing my best to “keep my head” so Jake can “keep his head.” Time will tell if I am successful. (above) Lil running Extreme Barrelers at the Fun Raiser the day after the seminar. She earned a 15 point Q (points are based on the dog’s speed) which earned her Novice Title with an extra 5 points to spare. Lil has always turned incredibly tight. You can see how she makes 90 degree turns out of each tunnel and also how tightly she turns around barrels which cut her yardage significantly. I love running more than one dog. Jake is a total blast to run when he is ON but its great having a dog like Lil who is ON 99% of the time and super fun to run too. Lil helps me keep everything in perspective. Lil’s V-NATCH photo with Judge Ron Young. (above) Lil’s Versatility NATCH photo with Judge Ron Young. It was cool that Lil earned this Championship Title under a judge who knew us from the East Coast. I didn’t feel any pressure about this run being for Lil’s V-NATCH, because Lil runs Weavers courses well. The only reason we lacked Elite Weaver’s Qs is I tend not to enter this class when it is offered late in the day on Sundays, which seemed to be fairly common on the East Coast (this is not a complaint though). I just personally prefer to run Elite Weavers (3 sets of 12 poles) with a fresh dog. But since moving to Colorado in July, I’ve found many trials offer Weavers on Fridays, so we were able to get 8 needed Elite Weavers Qs (for a total of 13) over the past 6 months. (above) Lil’s Versatility NATCH run at Mountain Dog Sports on Friday. Having recently participated in Paula Goss’s Advanced Distance workshop, I knew exactly how I wanted to handle Chances courses this weekend. I knew WHERE I wanted to be, and WHEN I wanted to be there to show my dog the correct path ahead. I handled Round 1 and 2 the same way with Lil and Jake and both dogs ran the course beautifully. I made the same mistake with Jake both rounds and pulled him off a hoop but I was so happy with how well he ran this course both rounds. This was a tough weekend for Jake. He found the temptation of huge mounds of horse poop along the one side and the back of the arena to be too much to resist on about half of his runs. But on Sunday, I only lost him to horse poop on one run. The Chances course on Friday was one of the most challenging courses I’ve encountered. There was only one Q in the entire Elite class. Lil didn’t Q due our only missed dog walk / tunnel discrimination of the weekend, but I loved how well she ran the uniquely challenging portions of this course. The coolest thing for me was that I knew exactly WHERE I wanted to be to send her out to 2 jumps after the second tunnel….which was as far away as possible from the tunnel exit when she emerged. My plan worked beautifully. Another challenge I felt really good about was the left turn after the first tunnel. Once again, I knew WHERE I needed to be.. and WHEN I needed to be there in order to pre-cue that left turn before Lil ran into that first tunnel. Plus she totally aced running through the “box” in the center of the course twice. The first time was straight through 2 hoops to the far entrance to the purple tunnel. The second time was from the exit of the purple tunnel OUT to the jump. Jake’s contacts were PERFECT all weekend long. So were his tunnel/ contact discriminations. There were many things to feel good about which helped balance out numerous Es due to Jake wolfing down huge mouthfuls of horse poop. SIGH. Good thing we don’t need no stinkin’ Qs. HA HA and true! (above) a few of Lil’s runs plus Jake’s run during a lunch break from Paula Goss’s Advanced Distance Workshop. 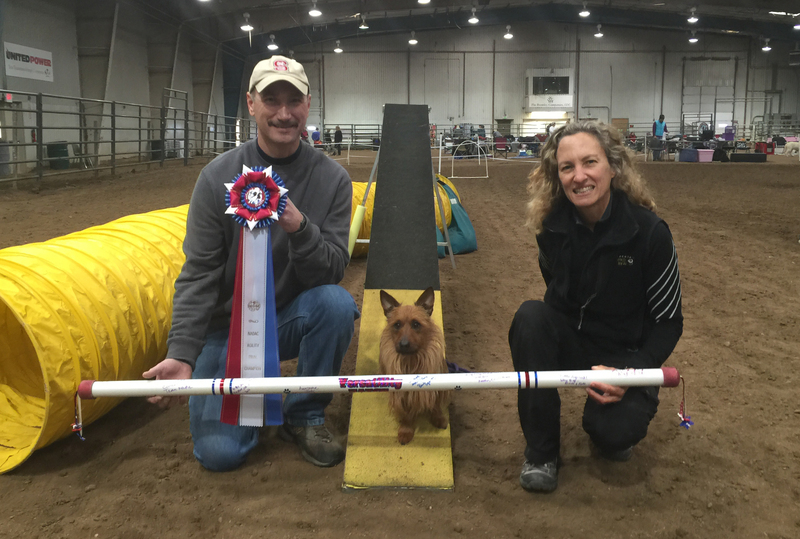 Paula Goss is a fantastic agility instructor. She has a great eye and set up challenging courses that could be worked from a variety of distances so each team was challenged yet not over-faced. She also shared some great tips for training and course analysis. I left the workshop with fresh ideas for what I want to practice at home. I really don’t know how she kept going and going and going….like the energizer bunny for 3 days straight…. especially because it was HOT and SUNNY. Amazing! Plus her vibe is so upbeat and fun AND her demos of handling moves are inspiring to see and then try to mimic. Paula’s handling is precise and graceful, yet totally punchy and dramatic when it needs to be. I have a long way to go before I will be capable of handling anywhere close to Paula’s level but I am totally jazzed about trying. Jake and Lil are so confident running big loops with great speed and distance, I decided to try something new. Instead of a digging out a simple circular luge track with a bisecting line, I designed a track that would allow us to practice GO ONs, GET OUTs, as well as a variety of tighter and wider TURNS. On a side note, the A-frame can be incorporated if the grass is dry or barricaded if the grass or contacts are slippery. There are 2 more loops in my grand design 🙂 but that part of the yard has a lot of heavy snow so digging will have to wait until the snow melts down a bit. Plus there are plenty of fun options to explore with the current set-up. What a nice break from winter we all had in Arizona attending 2 NADAC Trials and a 3-day distance workshop with Paula Goss, which I’ll be writing about in a separate post. Here are a few of Jake and Lil’s runs. They both ran so well on turf and stayed perfectly clean. What a nice change of pace from running in horse arenas around Boulder. Lil ran a great Jumpers Bonus Box course on February 1, which happened to be her 6th Birthday. I could not be more proud of her. She ran with full confidence and really nice speed. Feel free to MUTE the audio. I was a total blabber mouth but Lil is used to me doing that and ran really really well in spite of it….. or maybe because of it (GASP)! Jake’s new 4-on contacts were stellar and he earned his Open Touch N Go Title. The only time he didn’t stick a contact was when a disconnect occurred between us earlier on course. He still hit within the contact zone but since stopping 4-on is now part of our criteria, I asked him to return to a 4-on once as a test. It seemed to have a calming affect on him. After a brief pause and praise, I released him and he appeared completely centered, reengaged, and I could tell he did not perceive it as punishment. If I had to guess, he experienced it as a reset (physically and mentally) and he finished the course running beautifully. I wish I had a video of that run. I have been playing around with asking for 4-0n the A-frame with Lil but after seeing her response at this trial, or should I say lack of response over the first two A-frames at our first trial since training a 4-on, I decided I didn’t like it for her. I think her long history of running over A-frames trumped her short history (under a month) of stopping 4-on and I really didn’t like how it caused her to shorten her striding down the A-frame which made her dismount higher. So instead of trying to “make her stop” and potentially creating an issue with Lil and the A-frame, I decided to just say GO ON like I always have and she went back to her typical style of running over A-frames. For the record, the only reason I had contemplated switching Lil from running to 4-on was because NADAC trials can have 8′ or 9′ A-frames and Lil doesn’t automatically adjust her striding when she goes from 9′ (at trials around Boulder) to 8′ (in Southwest Colorado and at Champs). A stopped contact would have saved us the hassle of needing to train a few sessions on 8′ A-frames before we encounter those shorter A-frames in trials.. and at Champs, which is not convenient since I don’t have an 8′ A-frame. Oh well. Its not the worse thing in the world. I almost scratched Jake’s last two runs after he lost focus on a Chances course mid-day. I thought he was mentally done but I’m glad I changed my mind because he finished up the day with two fantastic runs, including this Open Weaver’s course. Jake has a bunch of Open Weaver’s Qs. The reason I have not moved him up to Elite is because I don’t think he needs to weave three sets of 12 poles and Open Weavers has two sets of 6 and only one set of 12. Too bad the video starts mid-course because Lil ran the opener super fast and weaved the first set of poles much faster than she has been weaving lately. I have wondered why her weaving has slowed down this past year. Is it mental? physical? emotional? Or maybe its due to weave pole bases being a little wider than the poles we train on at home. Regardless, I was very pleased with how well she ran this course. Jake has been running so well lately, I ran him very similar to the way I ran Lil in Tunnelers and Weavers… just a few feet less in terms of distance but the same basic handling. YEY Jake! Lil ran this course beautifully with me mostly staying inside a self-imposed Handler’s Box. I lost my nerve while leading out and released her before I got to my intended position but other than that, I stayed in my box, and Lil ran with full confidence. YEY Lil! It was so much fun to run agility outdoors and to reconnect with friends from Champs and Yellowstone Dog Sports. Plus I love having Sarah Fix as a judge. She always creates such a fun, upbeat vibe and this trial was no exception. Also agility folks in Phoenix are very welcoming. We’ll be back next winter for sure. I am LOVING what I’m seeing on the A-frame from both dogs. Stopping with four feet on (4-on) looks easy for them to do. I can see that Jake knows his job and is preparing to stop the entire descent with no hesitation before reaching the bottom. The way he is performing 4-on looks much easier on his body than jumping off from high in the contact zone (his natural MO) and I think 4-on might even be lessening the force in which he hits the up ramp due to early anticipation of the stop at the bottom. This morning’s session focused on distance. I wanted to test Jake and Lil’s understanding of WHERE to do 4-on. I really LOVE this style of 4-on for Jake because he has to plan ahead and reduce his momentum all the way down vs. with 2o2o, he would sometimes descend too fast and land hard into 2o2o which made me cringe years ago when I used to ask for a 2o2o. Lil’s running A-frame has been fast and consistent for a few years now. The reason I decided to mess with it is because in NADAC, A-Frame ramps can be 8′ or 9′ long and Lil was not able to transition from one to the other without training a fair amount in-between, so after thinking about it on and off for the past 6 months, I decided to see if I could train a performance that would allow her to transition back and forth without any extra training in-between the two different A-frame ramp lengths. I’m not sure what Lil’s end performance will look like on the A-Frame but I loved what I saw today. I find it amazing that she only started showing me she is able to stop 4-on a couple of days ago yet today she made it look easy. At this point, Lil often pops into a last minute and super soft 2020 when I’m ahead. Although I have never asked Lil to do a 2o2o on the A-Frame, she has been doing 2o2o since puppy hood on a variety of objects, so its not surprising that she is offering it on the A-Frame, especially because it requires less effort than stopping 4-on. But when I said WAIT, she was able to stop 4-on at the very bottom of the A-frame which impressed me. I guess this tells me she really doesn’t know what MARK means on the A-frame… yet. Once I feel she is anticipating stopping with 4-on , I might early release her most of the time. Actually I might early release Jake sometimes too. But these will be future decisions. Right now I’m just enjoying seeing how quickly my dogs learned HOW to shift their weight back enough to be able to stop withe ease on a full-height A-frame…and the dog walk too. Mountain Dog Sports hosts GREAT trials. The vibe is always positive and fun and last weekend’s trial was no exception. 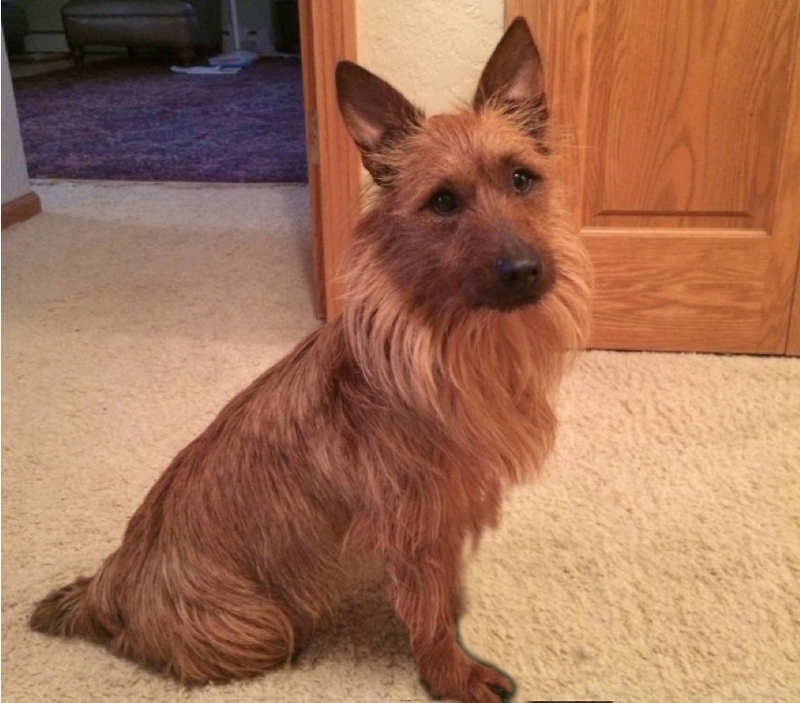 I had one goal coming into this trial and it was that my dogs run with their usual gusto and focus in what I consider to be a very challenging environment for Terriers…. an active horse arena. A little background……. Lil struggled the first time we trialed at this site in October. She lacked confidence and even lost focus a couple of times which is rare for her. Surprisingly Jake ran pretty well in October. He only checked into the Mouse Hotel in one corner of the arena once.. and gratefully he checked right back out after one or two JAAAAAAKE HEREs! So with the sole goal that my dogs run fast and focused, I decided to run with them a lot more than I usually do. Not sure how they would have done had I used more distance (maybe just as well) but I was very pleased with how well they both ran… AND for all the Qs they racked up! Lil ran 13 courses and Qed 10 of them. Jake ran 10 courses and Qed 5 of them. Jake also earned High in Trial for Open dogs. I could not be more proud of how well both dogs ran. What a fun way to spend a weekend! (above) The top row of photos are rotated 32.5 % so the A-Frame is horizontal. The photo on the upper right is the same photo as the large photo below, just cropped and rotated. I sort of already knew this but it really sunk in after watching the video footage of my dogs running over a full-height A-frame yesterday. You can watch the video I grabbed the screen shots from on yesterday’s post. (above) Compare Lil’s jumping arc over a bar and jumping off the A-frame. Incidentally, the Border Collie has a similar arc when jumping in extension but that is entirely different topic. 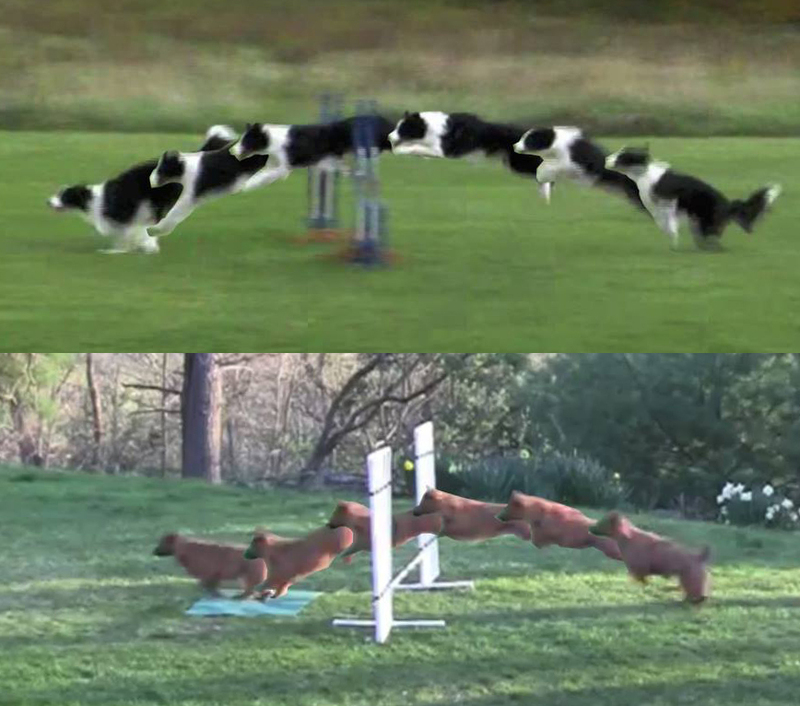 (above) Here is an example of how well many Border Collies (and other breeds) can collect and load well at top speeds, which makes it possible for them to jump UP at a steeper angle than an Australian Terrier. 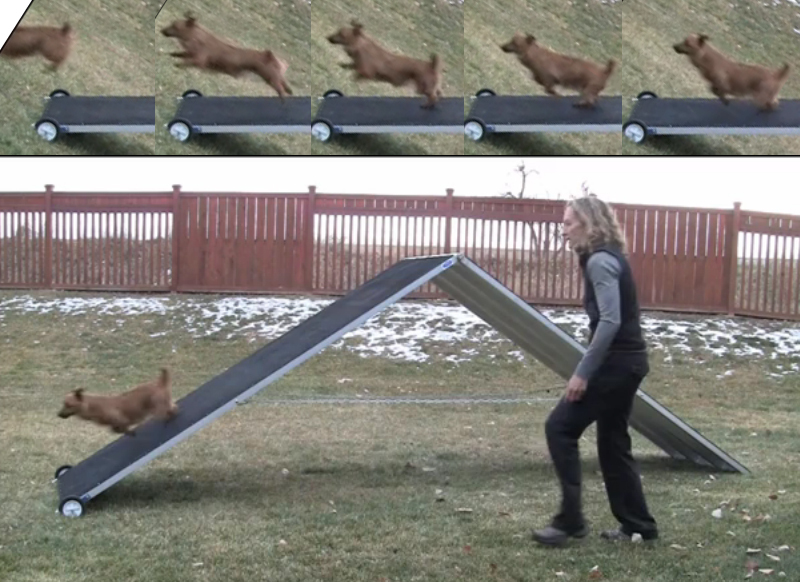 The typical BC structure allows dogs to change the angle of their trajectories dramatically when jumping bars (running on flat ground, then UP and OVER jump, then back to flat ground) and also when running over A-frames (flat ground, then UP and OVER the A-Frame, then back to flat ground). Longer legs also play an important role when running down the A-frame because like walking sticks, longer legs help dogs hold themselves back against the forces of gravity and momentum far better than shorter legs do. 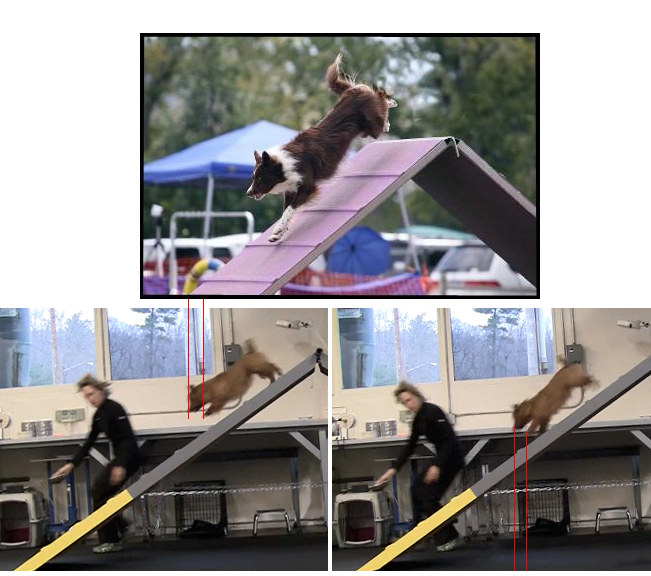 I think its fairly common for agility folks to attribute all “performance issues” to “training issues” but the more I observe dogs run agility, the more I see that structure can solve many riddles re: “why dogs do what they do” vs. assuming all performance riddles are caused by inadequate training. In the case of my particular dogs, once it became clear to me that their longer backs do not allow them to load very well, I was able to see that its more natural for ATs to jump in extension vs. in collection (if they are running fast). I also recognized that there is a limit to how high an AT can jump in extension with ease. But that is a different topic. Back to the topic of this post….I had a big AH HA yesterday…. drum roll please…. The structure of an AT influences how they jump on and off A-Frames the same way it influences how they jump over bars. ATs jumping arcs are naturally longer and flatter when jumping on and off the A-frame because they don’t load as deeply as longer-legged dogs. Duh. 🙂 As a result, their first stride on the A-frame is going to be lower than a dog who is able to load deeper and their dismount is going to be higher to avoid face planting due to their jumping arcs being flatter. This AH HA doesn’t mean I’m giving up trying to influence what they do on the A-Frame. I’m going to continue to try to decrease Jake’s speed on the approach slightly to soften his first stride on. I’ll also be continuing to experiment with various verbal cues to see how Jake and Lil respond to them in order to encourage the safest performances possible for each dog. Lil and I are developing a new start line routine. She has always preferred to stand at the start line, but since head bobs and nose touches have become linked to standing, I needed to change her position, at least for the time being. So for the past week I’ve been heavily rewarding SIT in Lil’s day-to-day life. I’ve been very careful to reward in ways that do not cause Lil to move her head and so far so good. Lil’s head has remained perfectly still and she is sitting faster and straighter with each passing day. One thing I have noticed about Lil’s sit position is its rather slouchy. Her front feet are not deep under her body and her head is not held high. This position can easily morph into the dreaded (HA HA) vulture pose which could easily lead to head bobs or nose touches. So one thing I’ve been doing a little here and there is asking for SITs with front feet on a Mark bucket. At first this was hard for Lil to do, but after maybe 10 reps over the course of a week, it became second nature. Just for kicks, I elongated Lil’s legs (below) to show how the angle of her back is similar to longer-legged dogs when her front feet are on the Mark bucket. Now, back to the slouchy sit. A friend suggested I ask for Sit Pretty (begging) but the thing that doesn’t work well with Sit Pretty and Lil is she positions her rear legs in a way that makes the position very stable and easy to maintain.. but she is not really sitting.. its more of a very low crouch. I assume she learned to do this in anticipation of “Sit Pretty to Stand back to Sit Pretty,” which is difficult for dogs to do but great for conditioning so we do it now and then. Since I don’t need or want any duration of Sit Pretty at the start line, I decided to train a new trick that will position her front feet deeper under her body. Below is a video of this new trick. Its pretty simple. Starting in a SIT, Lil lifts POPS her front feet up and back onto the ground, while maintaining a SIT position with her rear feet. Already I can see how well this trick is influencing her sitting position. Even before I cue POP, her front feet are already in a good, non-slouchy position under her body in anticipation of the next POP. The rep at 0:16 is exactly what I’m looking for: a small, fast popping up of front feet with feet landing a tiny bit deeper under her body. After watching the video I see that I have to be careful to reward her in ways that keep her weight shifted back. In some reps, she leaned forward to get the reward, which is the opposite of what I’m looking for. This is still very new for her so she sometimes offers a lingering Sit Pretty, which is fine since POP is still a new trick. My end goal is to be able to cue POP from any position and from any distance… but that will take a while… or maybe not. Lil is a super fast learner and this is an easy trick for her to do.